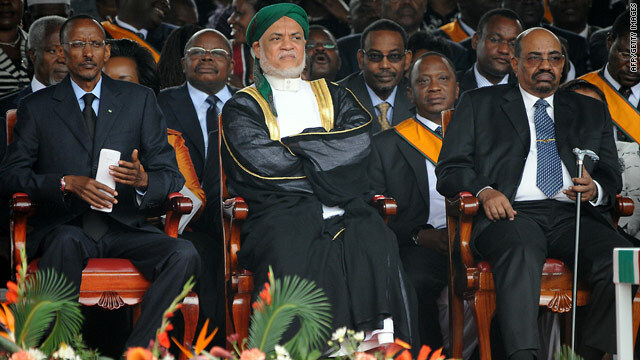 Al-Bashir, right, alongside Comoros President Ahmed Sambi Abdallah, center, and Rwandan President Paul Kagame, left. Nairobi, Kenya (CNN) -- Kenya and the African Union are defending a visit by Sudanese President Omar al-Bashir, who is wanted on allegations of war crimes and genocide. Al-Bashir on Friday joined other African leaders in Kenya to mark the signing of a new constitution, which is expected to usher in major change. The International Criminal Court has protested al-Bashir's visit to the U.N. Security Council. The Sudanese leader is wanted by the court in The Hague, Netherlands, on allegations of war crimes and genocide in western Sudan's Darfur region, where violence that erupted in 2003 has left at least 300,000 people dead. Kenya, a signatory to the criminal court treaty, was obligated to hand over al-Bashir, according to the international court. Kenya and the African Union rejected that stance, saying that the U.N. Security Council has not acted on a request to defer proceedings against al-Bashir for one year. Kenya also has "a legitimate and strategic interest in ensuring peace and stability in the sub-region and promoting peace, justice and reconciliation in the Sudan," according to a statement from the Kenyan Ministry of Foreign Affairs. Al-Bashir was invited to the constitution celebrations in Nairobi "as the head of a friendly, neighboring country," the Foreign Affairs Ministry statement said. However, Dennis Onyango, a spokesman for Kenyan Prime Minister Raila Odinga, said the prime minister believed the invitation was a bad idea. "The prime minister is against the invitation because Omar al-Bashir has been indicted by the ICC and Kenya is a signatory to the court. It sends wrong signals in regard to Kenya's commitment to the ICC and also Kenya's respect for human rights," said Onyango. Human Rights Watch has criticized Kenya for allowing al-Bashir to enter the country, saying that the wanted leader's presence would "forever tarnish the celebration of its long-awaited constitution." Pro-government militias known as the Janjaweed stand accused of ethnic cleansing in Sudan's Darfur region. Al-Bashir has denied that he helped armed the militias. Al-Bashir has traveled to several countries since the warrant was issued, including a recent trip to Chad. The International Criminal Court also protested al-Bashir's visit to Chad. On Friday, he was among thousands of Kenyans at the signing of the new constitution three weeks after voters overwhelming approved the referendum. Debates over a new Kenyan constitution had spanned two decades, but intensified after post-election violence left more than 1,000 dead in 2008. "For the last two decades, the people have yearned for a new constitution," President Mwai Kibaki said. Kibaki signed six copies of the constitution and held one up as the crowd erupted in cheers during the signing event at a park in the capital, Nairobi. The signing was followed by the national anthem and a 21-gun salute. Changes to the constitution include a more decentralized political system that minimizes the president's powers. It also calls for land reform and allows dual citizenship -- a popular issue with Kenya's large diaspora community.